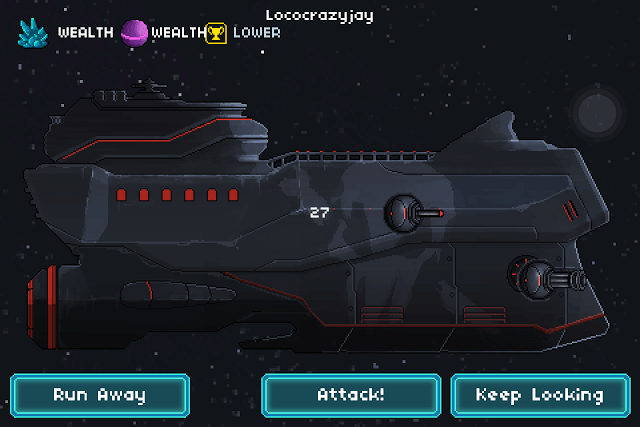 Pixel Starships brings 8-bit space warfare to your iOS devices. Developed by Savysoda, this spaceship management strategy game lets you control a starship and battle alien and rival spaceships in PvP and story-based missions. 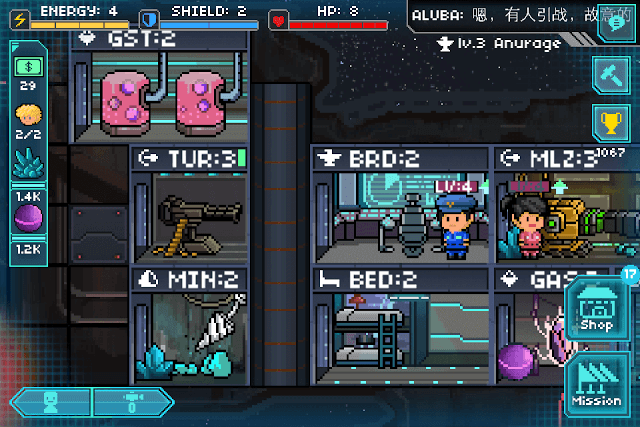 Managing your own starship is fun and the game mechanics is similar to Fallout Shelter and Tiny Tower. You will need to build rooms and optimize them before going to fight a space battle. Upgrades and new rooms require resources can be earned by defeating enemy starships. The game’s pixel-art graphics is top notch and the attention to detail given to spaceship design is marvelous. Zoom out and you can see the entire spaceship. Zoom in and you can what’s inside. Amazing visuals! Pixel Starships’ gameplay might be confusing at first, but once you know the basics, you will be able to manage your spaceship and chalk out your own strategies pretty well. These quick tips and hints will help you defeat enemy spaceships, optimize rooms and get rewards. The reactor is your ship’s heart and should be protected it at all costs. 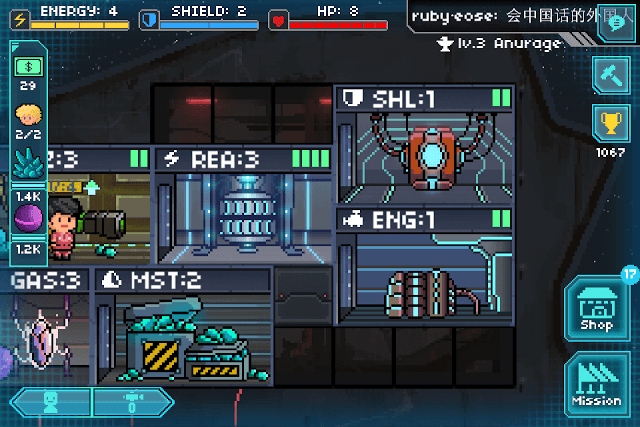 If your reactor gets damaged, assign crew members to that room and repair it. Upgrading the reactor also increases energy. On the battle screen you may have noticed a yellow “power bar” to your left. Well, it’s your ship’s available energy. Energy is allocated to different subsystems or rooms, such as the weapons, engine and shield room. Because of energy, your weapon rooms can deal damage to enemy ships and your shield room protects it from enemy fire. Just make sure, the reactor does not get destroyed by enemy fire. If it does, then the power bar will be disabled. Only some repair work will turn on power. At first, the power bar will have only two energy bars, which will be allocated to your main weapon subsystem (laser control). However, later you will have more than one weapon subsystem and a shield room in your ship, so you will need more energy to power additional rooms. All you have to do is upgrade the reactor to get more energy. An upgraded reactor will increase energy and the yellow power bar will have more energy bars. Energy will be allocated to different subsystems, helping you get closer to victory faster. and if you have some extra energy left then assign them to engine. Whether you are battling a random player’s starship or an AI, care should be taken that your ship’s reactor shouldn’t be damaged, else your ship won’t be able to attack enemy ships. In battle mode, you should first drag the aim icon to enemy’s reactor and immediately tap on the left arrow to zoom to your ship. Don’t keep looking at the enemy’s ship. Your weapons will keep attacking the assigned target automatically. You may sometimes tap on the right arrow to zoom to enemy, but your focus should be on your starship. 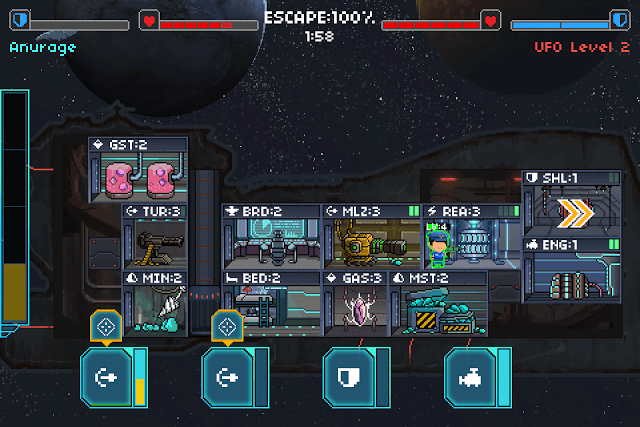 Once you have zoomed in to your ship, keep an eye on each room to see which of them are being targeted. Press a crew member, hold and drag it to your reactor (because that may be the first room your enemy will target) when it’s damaged. Your crew member will repair it in no time. Make sure your crew member is in room adjacent to the damaged room. If the room is above or below the room where the crew member is staying, then make sure there’s a elevator that can take him up or down. Don’t keep him in the reactor room. Chances of him getting killed are more if he is placed in that room. Quickly assign him to some safe room or an adjacent room below the reactor. You should recruit more crew members via shop if you want to repair room faster, but make sure you have upgraded bedroom first to increase the total cap. Also, don’t forget to level-up your characters to improve their repair rate, attack and other key stats. In PVP mode, you will have to destroy your opponent’s starship before the timer runs out. If you fail to destroy, then you will be defeated, even if it means your opponent’s ship is 75 percent damaged. You will have to destroy it completely to emerge victorious and get battle rewards. A PvP defeat deducts a few resources and ranking points. You may tap on “Escape” to escape battle, but won’t get any rewards. To avoid defeat, try building another weapon room. Two weapon rooms shooting in tandem will make it easier for you to penetrate a ships’ shield, destroy key rooms such as the Reactor and decrease ship’s HP faster. At first, you will need to build a Turrets room. Keep upgrading and max out its level. Upgrading turrets will reduce the reload time and improve other stats. A low reload time would mean faster firing rate. Along with turrets, try to upgrade the Mining Laser or your main weapon room to decrease its reload time. When you have collected enough gas, build another weapon subsystem that is effective against shields. The Small Missile Launcher is an example of such room. It can destroy shields by reducing an enemy ship’s shield levels faster. New weapon rooms appear after you upgrade your starship. Before battle starts, check whether your opponent’s starship level is “Higher”, “Even” or “Lower”. A higher level starship will probably be tougher to destroy than a lower and even starship. An opponent starship’s level status can be seen at the top left corner of the screen. Tap on the “Attack” button at the bottom of the screen if the level is Even or Lower. If it’s “Higher”, then tap on “Keep Looking”. The AI will randomly suggest another starship and maybe next time you will get a better match. If you don’t want to battle anyone, just press the “Run Away” button. Make sure you take a battle decision before the timer runs out. You will have around 30 seconds to decide whether you want to battle a ship, keep looking for others or leave. You will obtain minerals and gas after destroying your opponent’s spaceship. Make sure the starship has plenty of loot available. Just beside the level status is the resources status. 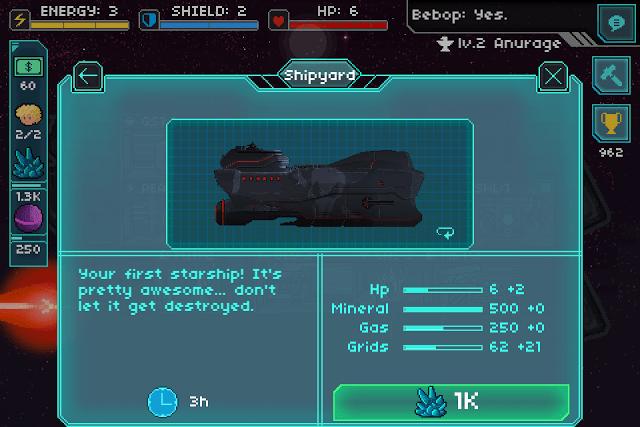 If the status displays “Barren”, then you will receive fewer resources after defeating a ship. If it displays “Wealth”, then there’s more loot to collect from a destroyed ship. I always prefer battling ships that have “Wealth-Wealth-Even” or Wealth-Wealth-Lower”. This tiny subsystem can be of immense help if placed on the right slot. Placing armor in an empty slot adjacent to a room will improve its defenses. Place it close to multiple rooms to reduce damage to them. Have a reactor, engine and shield in one area of a starship and place the armor in the middle of them (it’s tiny and just takes one small square) to reduce system damage of at least two rooms. You can build more than one armor and place them between key subsystems to boost their defenses by a certain percentage. Destroying an enemy ship’s reactor is the best way to disable its weapons. When battle starts, drag the aim icon to your enemy ship’s reactor room. If you have two weapons, then have both aim icons placed on it. Once destroyed you may target other rooms and destroy them, although it’s not necessary. Just keep attacking the reactor and the enemy HP levels will decrease. Your goal is to reduce enemy ship’s HP to zero. If your mining laser is powered fully, then it will attack a different room automatically after destroying the target room. Upgrade the Reactor to increase energy. This will help you assign more energy to key rooms in battle mode. More energy bars, more rooms will be powered. Upgrade the Shield room to reduce reload time and increase max power. A low reload time would mean shields will keep protecting from damage if a laser attack results in a decrease in level of a shield bar. Once the meter is full, the shield levels will be reinstated partially. Upgrading max power will add another level to the shield bar, making it tougher for enemy ships to penetrate your starship’s shield. Upgrade Engine and bridge level to increase missile dodge chance. Upgrade bedroom to increase the crew member cap. If you want to add another crew member, you should level up the bedroom. Upgrading weapons room will reduce their reload time (faster firing rate) and increase damage rate. At the start of play, upgrade ship immediately once you have accumulated 1000 minerals. Go to Shop > Ship to upgrade your starship. This will add more grids to your ship and also increase the HP cap. Upgrade Mineral and Gas storage to increase storage capacity. Leveling up Mine and gas collector will increase production. You will require resources, lots of them, to build new rooms and upgrade them and recruit characters. You will need a hell lot of minerals to upgrade the entire starship. 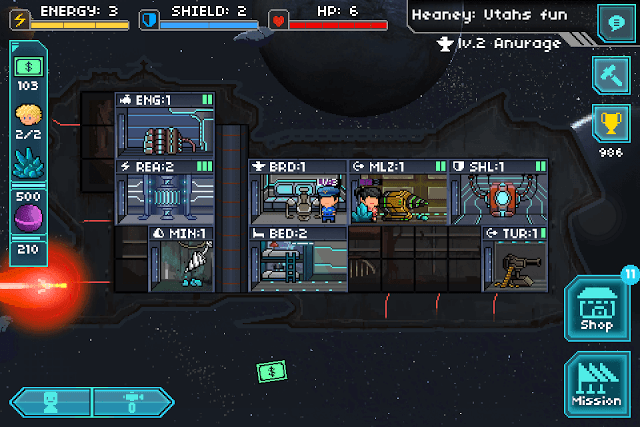 Upgrading your spaceship adds more grids, increases your ship’s HP. While Gas Collectors and Mines extract resources from space, they have a storage limit. To increase the storage capacity, build “Mineral Storage” and “Gas Storage” and keep upgrading them. Every time you upgrade, the storage cap increases to a certain level. This way you will be able to store resources that you get as loot after destroying enemy ships in story and PVP mode as well as resources extracted by the mine and gas collector. You will need gas to upgrade mineral storage and minerals to upgrade gas storage. The Mining Laser Room is one of the most powerful weapon rooms. This room also doubles up as a mineral extractor. Collect minerals from the Mining Laser room by tapping the mineral. Make sure you upgrade this room to improve capacity, level, reload time and other key attributes. You earn starbux when someone views the interior of your ship. Completing achievements is also another way to earn them. Tap the trophy icon and go to the Achievement tab to find out different types of tasks. In your home screen, starbux notes can be seen floating in space. Wait for a few minutes and you will see one going past your starship. Quickly tap on it to collect it. My preferred strategy in combat is to cripple the weapons first (so my enemy is defenseless), then cripple the reactor (so their whole ship is vulnerable).